In The Cop and the Anthem by O. Henry we have the theme of freedom, determination, class, change and hope. Set at the turn of the Twentieth Century the story is narrated in the third person by an unnamed narrator and after reading the story the reader realises that Henry may be exploring the theme of freedom. Throughout the story Soapy is prepared to sacrifice his freedom in order that he no longer has to live homeless on the streets of New York. Every action that Soapy takes is an action of hope. Whether it is to be sent to the Island (prison) or to finally turn his life around and get the job he was once offered Soapy never gives up and remains determined. Even if the consequences may be unpleasant to most people – going to prison. It is also interesting that Soapy as he is walking through the city is waiting for opportunities to get arrested and when they arrive, he never is arrested. It is possible that Henry is placing a spotlight (humorously) on the police themselves and suggesting that they may be ineffectual. Despite acting drunk, Soapy doesn’t get arrested. Also when he breaks the store window and admits to it, he also doesn’t get arrested. It is also interesting that at no stage in the story does Soapy lose hope. This may be important as not only does it display a level of determination as previously mentioned but it also shows that he is committed to his cause of going to the Island. It being clear to the reader that Soapy is being driven by his life on the streets of New York. Prison for Soapy is better than being homeless. Though some critics might find that hard to believe, Henry’s description of life for Soapy on the streets makes it easier to understand. He is reliant on charity, he is cold and he has the look of an individual who has seen better days. This is in contrast to the other characters that Soapy encounters during the day. All who are very well to do and appear to live successful lives. This may be important, the differences between Soapy and the other characters, as Henry may be placing a spotlight on the contrasting lives of those who live in New York. Some are wealthy or well to do and some like Soapy are down on their luck and looking at prison as being a better alternative to living on a park bench. The title of the story is also interesting as in many ways it suggests there are two paths that Soapy can follow. The Cop obviously represents the Island and a life in prison. Something that Soapy is choosing at the beginning of the story. However the anthem played at the end in many ways represents not only who Soapy was but who he could be again. If anything the anthem is aspirational to Soapy. It represents a good honest life that Soapy can live on his own terms. Leaving behind his old life and the troubles that come with it. The anthem empowers Soapy to live behind his old life. The reader aware that Soapy’s reason for wanting to go to the Island in the first place is so that he has somewhere warm to live for the winter. Though he knows he must commit a crime to get to the island. The anthem represents hope to Soapy. The end of the story is also interesting as Henry appears to be introducing further irony into the story. After Soapy decides to make enquires about his previous job offer he is arrested by a policeman for loitering. Despite all his previous attempts to get arrested and being unable to do so. Now when Soapy is on a path of change he gets arrested when he doesn’t want (or need) to. In many ways this is ironic because all the aspirations that Soapy has are lost. Where previously he wanted to go to the Island and then changed his mind he still ends up being sent to the Island for three months. Any chance Soapy has to change his life appear to be lost. He has succeeded in his goal of going to the Island, though the reader is also aware of his real aspirations and hopes. To reclaim his old life. 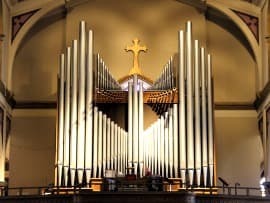 Something that has been triggered by listening to the anthem being played on the church organ. McManus, Dermot. "The Cop and the Anthem by O. Henry." The Sitting Bee. The Sitting Bee, 10 May. 2016. Web. Thanks Arindam. I’ll bear that in mind.